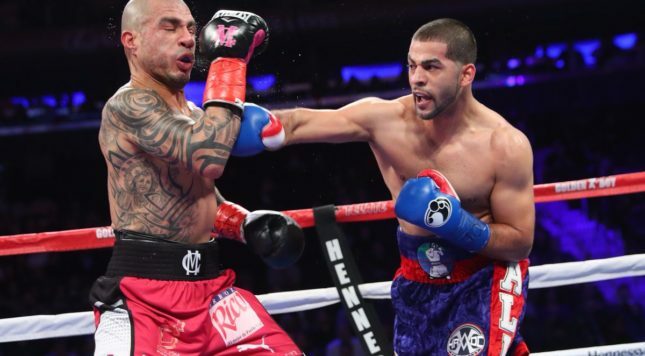 There was no storybook ending to the Hall of Fame career of Miguel Cotto Saturday night on HBO, as his farewell bout turned into a decision loss to Sadam Ali. But there was a poetry to it: Cotto concluded his time in the ring the way he lived it, delivering one last exciting battle in a long ledger. Ali was a risky choice for the 37-year-old Puerto Rican great. While he was moving up in weight to 154, and got KO’d at 147 by a so-so puncher, he also is a speedster with Olympic savvy. As long as he didn’t knocked out at the new weight, Ali was going to have a pretty good chance of beating Cotto. Ali took charge pretty early, nailing Cotto with a right hand that wobbled him. He had Cotto on shaky legs again in the 4th, 8th and 10th. But Cotto did adjust by the middle of the fight to Ali’s right, feinting his way in and recognizing when Ali was going to throw it. It looked like the momentum had shifted as the visibly slower (than both Ali, and his younger self) Cotto started to find a home for his trademark left hook to the body. Instead, Ali adjusted right back, making his left hand into a weapon, too, both the uppercut and hook. Cotto said after that he injured a bicep, probably around the 7th round. That might explain why he pretty much stopped winning rounds after the 8th, and by the end of the bout he was mainly just dodging, save one last surge in the 12th. But all the wobbly business and Cotto’s rallies make it plenty fun. Ali won by scores of 115-113 twice and 116-112, all viable. It’s a nice career rebound on a big stage. He looked solid in there at 154, and he’ll surely get a nice fight next because of the high-profile win. He really should’ve stopped Cotto, though, and inexplicably kept backing off when he’d hurt him. And maybe he wasn’t super-filled out. Still, it’s encouraging for his prospects that he could wobble anyone at the weight. Good for him. As for Cotto… it was a helluva run. On a personal note, his rise coincided with my burgeoning boxing fandom, so he was always a favorite. Dude didn’t really have just one career: super-prospect, vulnerable action hero, fallen and disgraced (in the eyes of many) quitter, menacing puncher turned boxer, second banana to the best two fighters of his era, revived middleweight champ. You can pick apart a lot of that. Yeah, he quit against Antonio Margarito, but Margarito might also have had loaded gloves (that’s pure, if not uninformed, speculation based on Margarito getting busted with bad wraps in his very next fight against Shane Mosley. Yeah, he might have won the middleweight championship after adding Freddie Roach to his corner, but he also beat a dead-legged Sergio Martinez, so how “revived” Cotto was is in question. His Hall of Fame credentials aren’t stellar, but they’re enough. Beating even the version of Martinez he did was the cherry on top. His runs at 140 and 147 were excellent, with the Shane Mosley win his biggest and best. He came up short against Manny Pacquiao (by a lot) and Floyd Mayweather (by not so much). Cotto giving Floyd one of his toughest bouts counts for something, too, even in the loss. Whatever the merits of his victories, what many fans will likely remember about Cotto is just how damn thrilling he was most of the time. The Ricardo Torres seesaw, the Zab Judah shootout, the first Margarito showdown, the Joshua Clottey brawl, the Mosley battle, the Mayweather test… there’s a ton of great stuff in there. He was always too taciturn outside the ring for your stereotypical exuberant Puerto Rican boxing hero, to be sure. These are quibbles. He did his talking in the ring, and whether he won or lost, ultimately you could be pretty sure you’d be entertained and he’d fight pretty much anybody. Fare thee well in the next phase of your life, Miguel Cotto.